These potato gnocchi are light puff balls that substantiate this dish without making it too heavy – they’re crispy on the outside and Mmmmmmeltingly tender on the inside. The inevitable is on our doorstep, breaking through the clouds drop by drop. Yes, October is bringing autumn with it. The colours that line the local canal have transformed from fresh green to hues of burnt orange, contrasting with the black, seemingly bottomless stretch of water. I needed something light and bright to pick me up, but it had to be comforting and a little bit luxurious. I don’t know about you but for me, a plate of potato-y starchy goodness covered in oozing egg yolks with parmesan fits the bill perfectly. So here’s my decadent Breakfast Eggs with Magic Balls! 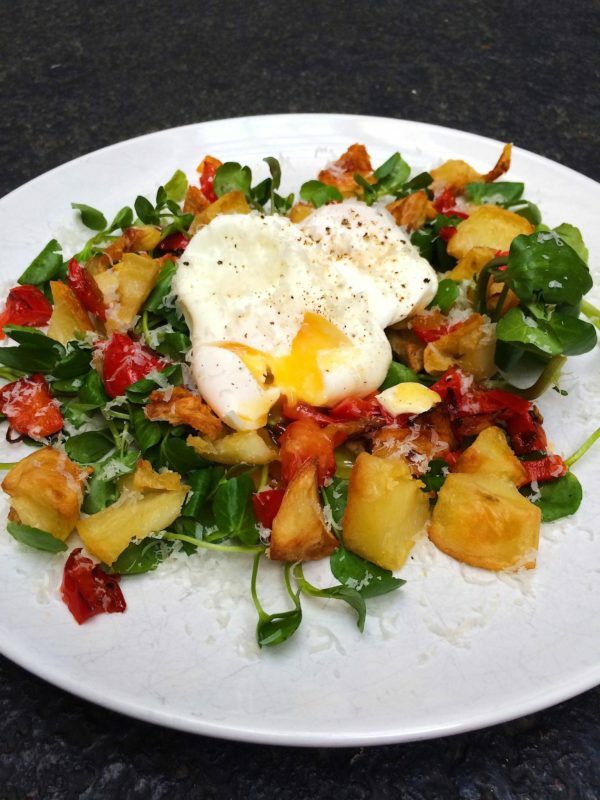 A bed of cress gives the dish a fiery pepperiness, while softened red peppers (bell peppers/capsicum) and onion give a sweetness that enhances the richness of softly poached yolks and parmesan. The potato gnocchi are light puff balls that substantiate the dish without making it too heavy – they’re crispy on the outside and meltingly tender on the inside. While they do demand a bit of attention, and take a few steps to make, they are worth it and really make this dish unique and special. If, however, you don’t have time, you can swap the gnocchi for simple roasted potato chunks – the choice is yours. Happy munching. 1 Let’s start off with the gnocchi as we all know the delights of waiting around for potatoes to cook! You can steam them if you prefer, or else, cook them in gently boiling water until tender. Drain well then push them through a large metal sieve with a rubber scraper (don’t process them as the purée can turn gluggy). Mix in the butter and half a teaspoon of salt, and put them aside to cool. 2 Next up, heat the oil in a large frying pan (skillet) and add the red pepper and onion. Cook on a very low heat stirring from time to time to ensure the pieces don’t catch. We want them to be softened to the max, so keep an eye on them to make sure there’s no burn. Once tender, set aside. 3 Bring the gnocchi back to the scene: to the now cooled purée, beat in the egg with a wooden spoon (beat vigorously at this point to draw in air, but don’t beat once the flour is added or the gnocchi will be tough). Sift over the flour and blend in. 4 Turn onto a lightly floured surface, knead very briefly to bring the dough together, then slice off a chunk of the mixture. Lightly flour the work surface and roll the potato mixture into a thin sausage shape (about the thickness of the handle of an old wooden jam-making spoon). Cut the roll into little ‘pillows’ with a sharp floured knife (the knife squishes the mixture as it cuts, leaving the pieces looking like elongated pillows). Repeat until all the dough is shaped. 6 Drop in the gnocchi one by one, plopping them into the water; work quickly, flicking them in with the handle of a spoon. Cook gently for about 2 minutes, or until the gnocchi bob to the surface and settle. Remove the gnocchi from the water with a slotted spoon, and put them in a bowl. 8 Heat oil in a fry pan and when hot add the cooked gnocchi and fry them until crispy! Done. Time to plate. 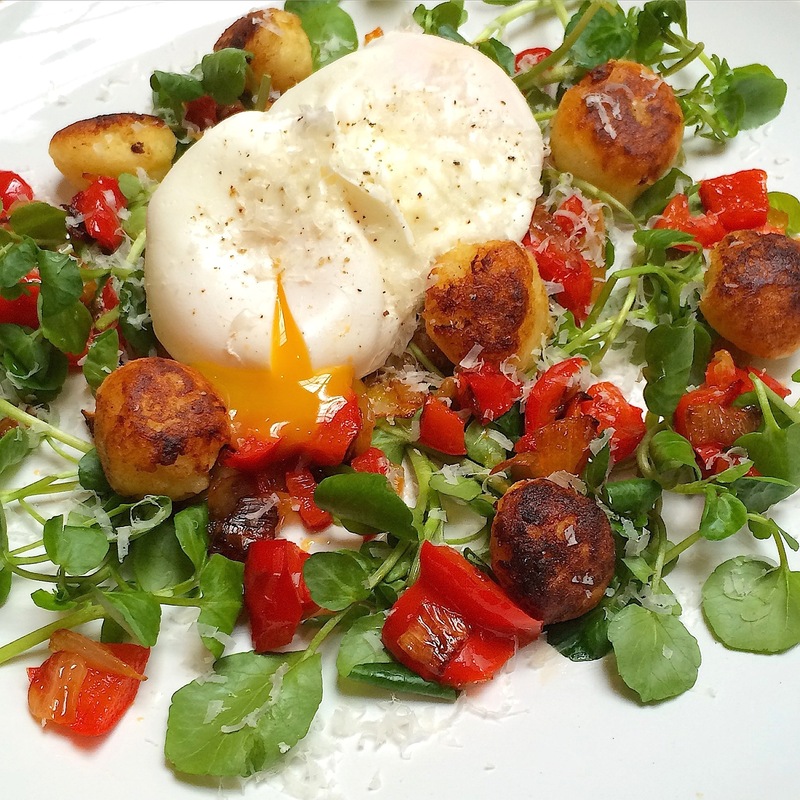 9 Put a generous handful of cress on to each of the serving plates, scatter over the red pepper and onion mix and crispy gnocchi, followed by the eggs. Sprinkle over finely grated parmesan and lemon zest, then season generously with salt and pepper and serve immediately! This gnocchi recipe makes heaps as you’ll see, so only cook how many pieces you want to eat now – transfer the rest to trays lined with baking paper (I find this is the best thing to use to prevent sticking). You can cover the pieces loosely with more baking paper, or waxed paper, and leave in a dry place for up to 2 hours before cooking (do not leave them in a steamy atmosphere or they will become sticky), or refrigerate for up to 4 hours. Alternatively, freeze any you don’t need on a tray. Once frozen, transfer to a container. Cook from frozen, allowing about 5 minutes’ cooking. Plump and fluffy snowy white eggs with golden flowing yolks – here's how to do it. There's a bit of action with pots and pans required for this dish, but it's pretty easy to do none-the-less.